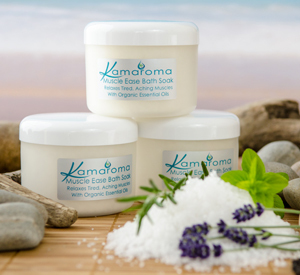 Kamaroma offers a unique bespoke service which gives you the opportunity to have skin care products formulated and made specifically for you. We can formulate anything from a single product to a full range of complementary skin care products to suit your particular needs. Our clients have had alleviation of of their symptoms of dry skin (xerosis), atopic dermatitis, eczema, mild psoriasis and acne. Initially there is a full consultation during which we take a comprehensive review of your requirements. We also agree on the products that would be made up for your personal use. The initial consultation charge is £30 plus £20 per product required. The products are then formulated and full costs are advised prior to manufacture. Once the costs are accepted and paid for, your skin care products are made and delivered to you. Following your initial purchase of bespoke natural skin care products, you will be provided with a unique log-on to our web site to access your products for future purchases. Your products will not be accessible to any other party accessing our web site. Please note that these products will be designed to be used by you only and may not be suitable for use by others. Do not allow other people to use your products. Please contact Kathryn Caizley to arrange a suitable appointment.